(Cleveland, OH) – Fueled by a triple-double from LeBron James, the Cleveland Cavaliers kept their postseason record perfect at 10-0 and took a 2-0 lead in the Eastern Conference Finals with a 108-89 victory over the Toronto Raptors at Quicken Loans Arena on Thursday night. James ended the night with 23 points, 11 rebounds and 11 assists, though Kyrie Irving led all scorers with 26 points, adding four rebounds and three assists. James also moved into fourth place all-time in career playoff scoring, passing former teammate Shaquille O’Neal. Kevin Love also contributed 19 points and five rebounds, while Tristan Thompson narrowly missed a double-double with nine points and 12 rebounds. Rounding out the Cavs’ scorers in double figures were J.R. Smith with 12 points and Channing Frye with 10. The key stretch of the game came with just over four minutes left in the second quarter and the game deadlocked at 46. Love’s basket lit the fuse for a deadly combination of offense and defense in the closing moments of the period that allowed the Cavaliers to close the half with a 16-2 run. That offense was bolstered by a defense that forced the Raptors to miss their last nine shots and 11 of their last 12. By the time intermission came, Cleveland found themselves leading 62-48. “We just made some defensive adjustments and got more physical,” Lue said about the late run. The Cavaliers defense kept up the pressure after the break, limiting Toronto to just 35 percent shooting from the field in the third quarter. That allowed the Cavs to bump up their lead by a point, taking an 86-69 lead into the final period. In the fourth, the Raptors never threatened, with the closest margin being 16 at 99-83 with just over five minutes left. 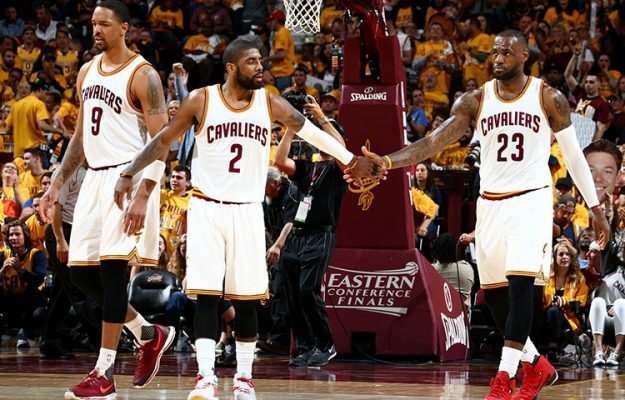 That latter effort was a success as Cleveland held a 37-18 advantage in free throw attempts on the evening. James got to the line 17 times, though he was only able to hit nine of his shots. However, James’ overall performance didn’t go unnoticed by Thompson, who talked immediately after the game about his value to the team. The victory also gives the trio of James, Irving and Love a 14-0 record when they’ve played in the same game during the postseason. Game 3 will be in Toronto on Saturday night, with tipoff set for just after 8:30 p.m. ET.